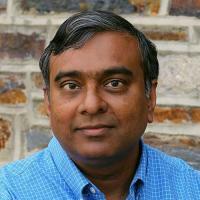 Krishnendu Chakrabarty is the John Cocke Distinguished Professor of Electrical and Computer Engineering and Professor of Computer Science at Duke University. He is Chair of the Department of Electrical and Computer Engineering. Please note this web page is not updated regularly. For up to date information, please go to: http://people.ee.duke.edu/~krish/. Zhong, Z; Li, Z; Chakrabarty, K; Ho, T-Y; Lee, C-Y, Micro-Electrode-Dot-Array Digital Microfluidic Biochips: Technology, Design Automation, and Test Techniques., Ieee Transactions on Biomedical Circuits and Systems, vol 13 no. 2 (2019), pp. 292-313 [10.1109/tbcas.2018.2886952] [abs]. Poddar, S; Bhattacharjee, S; Nandy, SC; Chakrabarty, K; Bhattacharya, BB, Optimization of Multi-Target Sample Preparation On-Demand With Digital Microfluidic Biochips, Ieee Transactions on Computer Aided Design of Integrated Circuits and Systems, vol 38 no. 2 (2019), pp. 253-266 [10.1109/TCAD.2018.2808234] [abs]. Tang, J; Ibrahim, M; Chakrabarty, K, Randomized Checkpoints: A Practical Defense for Cyber-Physical Microfluidic Systems, Ieee Design & Test, vol 36 no. 1 (2019), pp. 5-13 [10.1109/MDAT.2018.2863118] [abs]. Liu, M; Xia, L; Wang, Y; Chakrabarty, K, Fault Tolerance for RRAM-Based Matrix Operations, Proceedings International Test Conference (2019) [10.1109/TEST.2018.8624687] [abs]. Georgiou, P; Vartziotis, F; Kavousianos, X; Chakrabarty, K, Testing 3D-SoCs using 2-D time-division multiplexing, Ieee Transactions on Computer Aided Design of Integrated Circuits and Systems, vol 37 no. 12 (2018), pp. 3177-3185 [10.1109/TCAD.2017.2780054] [abs].